Where employers are receiving applications from a high volume of suitable candidates, group interviews are becoming a way for them to filter out the good from the outstanding. You may have seen these in the form of Recruitment Open Days as well as having been invited to attend a group session. Group presentations and activities form a large part of this style of interview, so how do you stand out in these situations? In this type of interview process, the employer is looking for a number of key elements – one of those being how you operate in a team. I’ve known people to go into these scenarios all guns blazing, taking over the presentation and dictating how, and who, should do what under the ill conceived idea that the employer wants a loud go-getter. In this situation the employer is almost always on the look out for how you will fit into their existing team. There’s nothing wrong with taking a lead in the group situation, but make sure you’re referring to other members of the group. 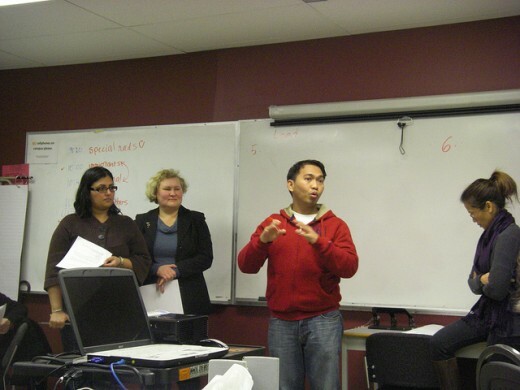 For example, it’s good to lead the discussion on who will present what information and make sure during the presentation itself you encourage this with the group. If anyone feels unsure about speaking up, provide encourage and empathy. There is a big difference between Leading – involving others in your thoughts and ideas, including & encouraging quieter group members, & delegating rather than dictating – and being Bossy – taking over the presentation, not allowing others to speak & ignoring others ideas. Get this right and the employer will immediately take notice. When placed in a group situation, it’s natural you will get on with some people really well, and not so well with others. Never forget your surroundings and who is listening into your conversations – the employer! Make sure you keep your language clean and behaviour in keeping with the company you’re presenting to. You should have done your research prior to attending, so remember to think about the company ethos, mission statements and culture – take your lead from this information and make sure you’re speaking from their perspective. It’s also worth mentioning to make sure you’re dressed the part. In this situation it’s always a good idea to make a real effort, you’ll immediately stand out against anyone that hasn’t. Even if the employer hasn’t stated that you will be asked to do a presentation, if you’re attending a Group Interview, be prepared for this outcome! You might be asked to do a short presentation on yourself, to present another member of the group or work as larger team to present on a topic. Make sure you do your research before you go, be prepared for every outcome and have some ideas ready for each scenario. Definitely make sure you have a mini introduction for yourself prepared – this should be something you have ready for any interview – and think about how you would work with others to go about delivering a presentation. Again, make sure you have done your research on the company. One employer I work with always asks clients to do a presentation on the company and although they provide information for the clients to do this on the day, it’s the ones who’ve done their research and have some extra information to hand that stand out. As mentioned above, the employer is likely to be using this opportunity to see how you will fit into the rest of their team, and work with the staff already on board. Referring back to the company ethos and culture will give you a good idea of what they’re looking for and this is where you should take a lead. Having said this, don’t forget to be yourself! A positive attitude and a good (appropriate) sense of humour goes a long way and can often help put others at ease. These are definitely qualities the employer will be looking for so don’t forget to be human! Daunting though it may be, don’t panic! Don’t shy away from the task at hand and miss out on your chance to make a lasting impression on the employer. If you feel your nerves getting the better of you, stop and take a deep breath. Rate your fear on scale of 1-10 and then question that, if you rate a 6, ask yourself – is this really worse than a 5? Keep repeating the exercise and you’ll find it helps to start steadying your nerves. Remember – You’ve been invited to attend because the employer knows you can do the job, you wouldn’t be there otherwise! They want to know who you are as person and make sure you’re right for them. Keep this in sight and you’ll be fine.